Top Ten Tuesday is the weekly meme hosted by the excellent blog The Broke and the Bookish. 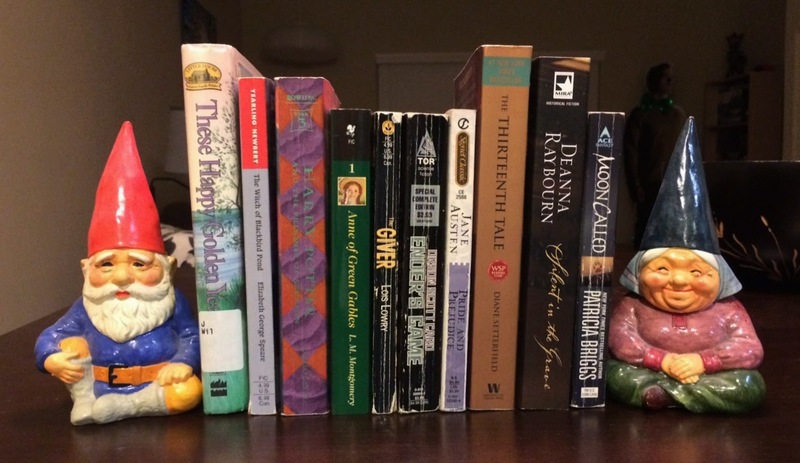 This week’s list is one I’ve been wanting to do for a few months: the ten books that have been most influential in my reading journey. I’ve seen a number of these lists floating around Tumblr and Twitter, and they all seem full of deep, philosophical, and sometimes (often) pretentious titles. This is not that list. These are books from various points in my life that I have loved unconditionally, read over and over again, and that have fed my imagination. So while this may not be the most remarkable list (especially for someone with an English degree! ), it is a truthful story of my reading journey. 1) These Happy Golden Years by Laura Ingalls Wilder – One of the first series I remember devouring as a child. I must have read the whole series half a dozen times, but this book, featuring Laura and Almanzo’s courtship, was my favorite. 3) Harry Potter and the Prisoner of Azkaban by J.K. Rowling – In my opinion, this book is when the Harry Potter series really comes into its own. It’s beginning to show signs of the darkness to come and it is proof that not everything is going to wrap up neatly from now on. 4) Anne of Green Gables by L.M. Montgomery – This series replaced the Little House series as I entered my teenage years. I always thought Anne and Gilbert’s love story was the most romantic. 5) The Giver by Lois Lowry – I first read this book in eighth grade, and I’ve read it nearly every year since then. I can practically quote it, I’ve read it so many times. I would say I’m excited for the movie, but I’m already dubious about the trailer (why is it in color? ), so I feel it can’t possibly live up to my high expectations. 6) Ender’s Game by Orson Scott Card –I first read this book as Junior in high school, and, like The Giver, I’ve probably read it a dozen time since. It’s another one I can practically quote, I’ve spent so much time reading and loving it. Last year’s movie was a decent adaptation of an abridged version of the book and I enjoyed it for that, but it could have been so much more. 7) Pride & Prejudice by Jane Austen – Although this is no longer my favorite of Austen’s novels (that honor goes to Persuasion), it was my first introduction to her world and Regency novels in general. I spent most of my teen and college years loving this book and looking for my own Mr. Darcy. 8) The Thirteenth Tale by Diane Setterfield – I resisted reading this book for a few years, for no real reason. When I finally did read it, I regretted all that time I’d wasted. This is definitely a novel that benefits from both a first reading and subsequent readings. 9) Silent in the Grave by Deanna Raybourn – Books in Raybourn’s Lady Julia novels have appeared on more than one of my Top Ten Tuesday lists for good reason. I am devastated that Raybourn is no longer writing full-length novels in this series, but the novellas are, at the very least, developing Julia and Brisbane’s relationship. 10) Moon Called by Patricia Briggs – This is, by far, my favorite current series. After reading Night Broken, the latest book that just came out this month, I can attest that it just gets better as it goes along. If I could have a relationship as solid and loving as Mercy and Adam’s (minus the supernatural aspect), I would be lucky. I can’t wait to see what comes next in my reading journey!